﻿ 2 Chronicles 16:9 "For the eyes of the LORD move to and fro throughout the earth that He may strongly support those whose heart is completely His. You have acted foolishly in this. Indeed, from now on you will surely have wars." "For the eyes of the LORD move to and fro throughout the earth that He may strongly support those whose heart is completely His. You have acted foolishly in this. Indeed, from now on you will surely have wars." 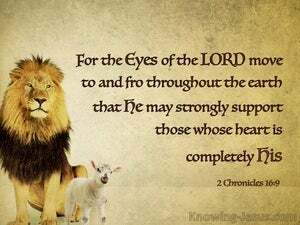 For the eyes of the Lord range throughout the earth to show Himself strong for those whose hearts are completely His. You have been foolish in this matter, for from now on, you will have wars." The LORD's eyes keep on roaming throughout the earth, looking for those whose hearts completely belong to him, so that he may strongly support them. But because you have acted foolishly in this, from now on you will have wars." For the eyes of LORD run to and fro throughout the whole earth, to show himself strong on behalf of those whose heart is perfect toward him. In this thou have done foolishly, for from henceforth thou shall have wars. For the eyes of the Lord go this way and that, through all the earth, letting it be seen that he is the strong support of those whose hearts are true to him. In this you have done foolishly, for from now you will have wars. For the eyes of Jehovah run to and fro through the whole earth, to shew himself strong in the behalf of those whose heart is perfect toward him. Herein thou hast done foolishly; for from henceforth thou shalt have wars. For the eyes of the LORD run to and fro throughout the whole earth, to show himself strong in the behalf of those whose heart is perfect toward him. Herein thou hast done foolishly, for from now on thou shalt have wars. 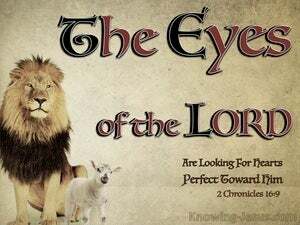 For Jehovah, his eyes run to and fro in all the earth to strengthen himself with the perfected heart of them to him. Thou wert foolish for this that from now there is wars with thee. For the eyes of the LORD run to and fro throughout the whole earth, to show himself strong in the behalf of them whose heart is perfect toward him. In this you have done foolishly: therefore from now on you shall have wars. For the eyes of Yahweh roam throughout all the earth to strengthen those whose heart is fully devoted to him. You have been foolish in this, for from now on you will have wars." For the eyes of Jehovah run to and fro in all the whole earth to show Himself strong on behalf of those whose heart is perfect toward Him. You have done foolishly in this; therefore from now on you shall have wars. For the eyes of the LORD behold all the earth, to strengthen the hearts of them that are whole with him. Herein thou hast done foolishly, and therefore from henceforth thou shalt have war." Certainly the Lord watches the whole earth carefully and is ready to strengthen those who are devoted to him. You have acted foolishly in this matter; from now on you will have war. For the eyes of the LORD run back and forth throughout the whole earth, to show himself strong in the behalf of them whose heart is perfect toward him. Herein you have done foolishly; for from henceforth you shall have wars." For, as touching Yahweh, seeing that , his eyes, are ever running to and fro throughout all the earth, to shew himself strong with them who are perfect toward himself, thou hast made thyself foolish over this, - for, from henceforth, there shall be with thee - wars. For the eyes of the LORD run to and fro throughout the whole earth, to show himself strong in the behalf of them whose heart is perfect towards him. In this thou hast done foolishly: therefore from henceforth thou shalt have wars. 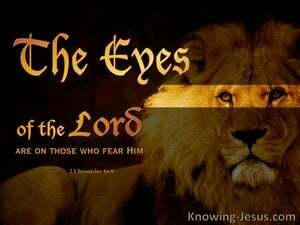 For the eyes of Yahweh run back and forth throughout the whole earth, to show himself strong in the behalf of them whose heart is perfect toward him. Herein you have done foolishly; for from henceforth you shall have wars." 8 "Were not the Ethiopians and the Lubim an immense army with very many chariots and horsemen? Yet because you relied on the LORD, He delivered them into your hand. 9 "For the eyes of the LORD move to and fro throughout the earth that He may strongly support those whose heart is completely His. You have acted foolishly in this. Indeed, from now on you will surely have wars." 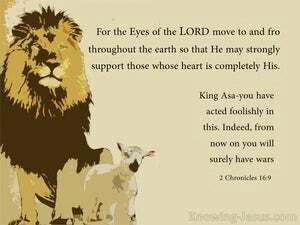 10 Then Asa was angry with the seer and put him in prison, for he was enraged at him for this. And Asa oppressed some of the people at the same time. Samuel said to Saul, "You have acted foolishly; you have not kept the commandment of the LORD your God, which He commanded you, for now the LORD would have established your kingdom over Israel forever. The eyes of the LORD are toward the righteous And His ears are open to their cry. Who humbles Himself to behold The things that are in heaven and in the earth? "FOR THE EYES OF THE LORD ARE TOWARD THE RIGHTEOUS, AND HIS EARS ATTEND TO THEIR PRAYER, BUT THE FACE OF THE LORD IS AGAINST THOSE WHO DO EVIL." David said to God, "I have sinned greatly, in that I have done this thing. But now, please take away the iniquity of Your servant, for I have done very foolishly." "But I say to you that everyone who is angry with his brother shall be guilty before the court; and whoever says to his brother, 'You good-for-nothing,' shall be guilty before the supreme court; and whoever says, 'You fool,' shall be guilty enough to go into the fiery hell.